Description: Long-lived perennial, suffrutescent from a woody branching base, sometimes sprouting shoots from thick, lateral roots; stems up to 25 cm tall, puberulent or glabrescent at the base and glabrous for at least the upper two-thirds; leaves linear to linear-lanceolate, appressed, 3-10 mm long; lower leaves mucronate and sometimes sparsely puberulent; upper leaves acuminate-aristate, serrulate, and glabrous; stipular glands dark and present throughout; sepals lanceolate, acute-aristate, margins serrulate with gland-tipped teeth, glabrous, deciduous in fruit, 4.5-7 mm long; petals broadly obovate, 10-13 mm long, 6-7 mm wide, orange or salmon with a broad interior dark orange or reddish band across the lower half above a short yellow band in the lowest 1-2 mm giving the corolla a basal yellow 'eye' around the ovary; stamens 5.5-7 mm long; anthers yellow, 1.2-1.6 mm long; styles 7-9 mm long, united to just below the 5 dark stigmas; capsules oval, straw-colored, 3.7-4 mm long, dehiscing into five 2-seeded segments; seeds reddish brown, 2.4-2.7 mm long, 0.9-1.1 mm wide. Flowers late April to early August. 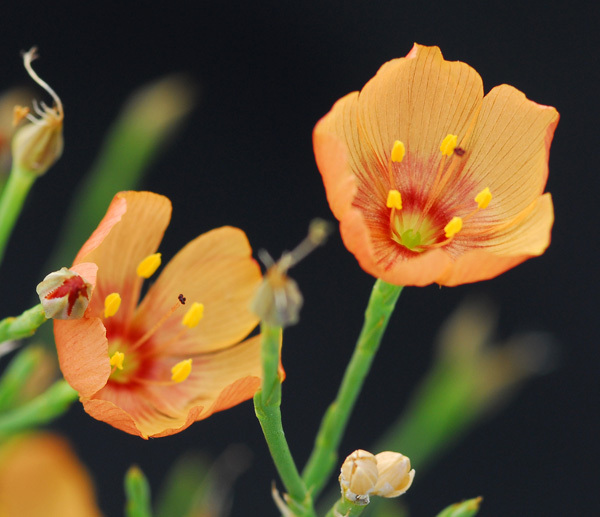 Similar Species: Linum allredii is the only orange-flowered flax with united styles that is a long-lived perennial with a branching woody base and thick lateral roots. Linum puberulum also occurs on gypsum in the Yeso Hills, but is usually annual (rarely a weak perennial) with a slender taproot and petals that are red below the middle. The corolla of L. allredii is also reddish on the interior lower half, but has a basal yellow 'eye'. Distribution: New Mexico, Eddy County, Yeso Hills; adjacent Texas, Culberson County. Habitat: Scarps and hillsides exposing pale sandy gypsum of the Permian-aged Castile Formation in Chihuahuan Desert scrub; about 1,280 m (3,900 ft). Remarks: Population densities in the Yeso Hills range from a few dozen plants on hillside habitats to several thousand individuals along narrow outcrops of pale gypsum exposed by long scarps. About 20 percent of the plants at the type locality reproduce asexually by sprouting new individuals along thick lateral roots. Conservation Considerations: Large-area herbicide application for 'range restoration' has already impacted part of the Yeso Hills and could become a significant threat to this species if allowed to continue. Road and pipeline projects have caused some impacts at a few locations and could continue as oil and gas development expands in this region. Gypsum mining is a potential threat. *Sivinski, R.C. and M.O. Howard. 2011. A new species of Linum from the northern Chihuahuan Desert. Phytoneuron 2011-33: 1-7.